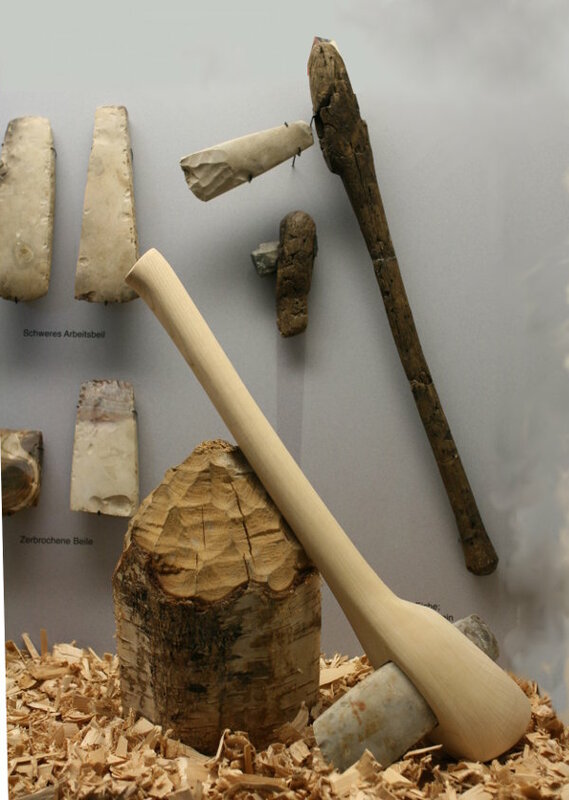 The stone axe was an important tool in the Neolithic: It allowed to cut trees and to clear forests faster than before and enabled the Neolithic revolution. Equally it was used as a powerful weapon. Therefore it does not come to a surprise that the axe was of high importance to Neolithic people. From the Paleolithic onwards stone was used to create tools. First tools for chopping were hand axes, made by chipping off flakes from flint stones. The innovation in the Neolithic was to polish the axe and to equip it with a haft. This tool was far more effective than the crude hand axes: First because through the haft more power could be passed onto it. Second the polished cutting edge was able to penetrate deeper into the wood. With the ‘polished’ axes woodland could be cleared in relatively short time and converted into fields: the basis for food supply. Some big axes found show marks of heavy usage. It is reckoned that these were used as simple means for ploughing, which means again for fertilising the land. 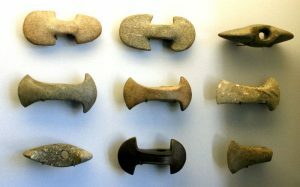 Neolithic (battle) axes (Landesmueum Schleswig) were prestigious status symbols and weapons. Neolithic stone axes are found all over Europe where people settled in Neolithic times. Indeed everywhere in the world human cultures used this tool during their Stone Age period (that includes even modern times, for example the North American natives). Axes were found in or near megalithic buildings. In the Carnac area, Brittany 106 axes were found in Mané-er-Hroek. Amongst some findings are small axes with perforations, made from rare stones like jadeite. They were very beautifully crafted and had no traces of tear. They might have been used suspended for decoration or ceremonial use. Axes were also found near British stone circles, for example in Avebury and the Ring of Brodgar. In Britain chalk models of axes were found in Stonehenge and Woodhenge. Because of its powerful attributes the axe plays also an important role in mythology and superstition. The thunder cult seems to go back to at least Neolithic times. In this cult the axe symbolises the thunderbolt hurled through the sky by a god. This cult lived on in the believe system of Nordic counties in Thor (or Donar) and his hammer. There were also remains of this cult present in historic times, as stone axes found were though to be ‘thunderstones’. In superstition the axe is generally used to avert harm or damage. Bächtold-Stäubli  lists several uses in Germany: axes put into fields were thought to prevent the crops from damage by thunderstorms, axes with the cutting edges upright put into the house were thought to prevent from diseases and other harm. H. Bächtold-Stäubli and E. Hoffmann-Krayer, Handwörterbuch des deutschen Aberglaubens, “de” Gruyter, 1935.